Are you still looking for an interesting topic for your bachelor or master thesis? 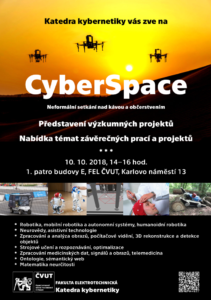 Department of Cybernetics invites you to CyberSpace, an informal meeting with coffee and refreshments, where we present some of the projects we work on and where you can take part in the form of your bachelor/diploma project. It is an excellent opportunity to meet in person your potential supervisors and team mates, and discuss the potential topics! At CyberSpace you will see e.g. the results in the area of vision for autonomous cars, humanoid robots, unmanned helicopters, spatial analysis and visualization of proteins, biomedical image analysis, or mobile applications for medicine. Other topics for bachelor/diploma theses contain machine learning and pattern recognition, optimization, evolutionary algorithms, assistive technologies, ontologies and semantic web, etc. If you like a topic, team, or project solved at dept. of cybernetics, contact directly the responsible person, or your prefered supervisor, and discuss the options with her/him. Drop in, we are looking forward to meet you!